Congrats to Emma Newman on her big Hugo win for her podcast TEA AND JEOPARDY! Find out more about all the Hugo winners here. 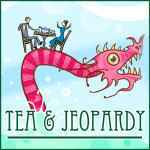 TEA AND JEOPARDY is a podcast featuring tea, cake, geekery, and mild peril co-hosted with her husband Peter. You can find this podcast on itunes, Emma’s website here, or wherever you listen to your podcasts.